The way we honor our veterans may vary. How Andrew Lumish pays tribute is truly amazing. Andrew Lumish has a lot of respect for veterans. 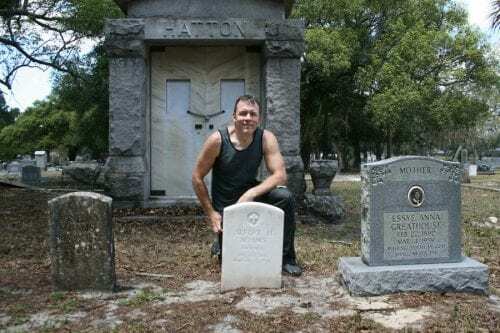 On his one day off during the week, Andrew travels to a Tampa, Florida cemetery equipped with a bucket. That and some cleaning supplies from the company he owns he searches. Finding a spot he kneels down, and gets to work. Now known as “The Good Cemeterian”, Andrew cleans the gravestones of our fallen soldiers. It all started with his love for photography, finding these beautiful gravestones. Bothered by how dirty and neglected some of them were, he decided to do something about it. Though he never served in the military himself, he still feels that these men and women should be remembered. Andrew doesn’t settle for just the cleaning. He also learns the stories of these veterans, doing research online and even going to the library to view death certificates. 600 gravestones later, Andrew was honored by The Department of Defense. Other states have even reached out to Andrew to clean some of their veteran gravestones. One story in particular stood out; Louis Franklin Vaughan.